Everything about Inwen is soft and dreamy. 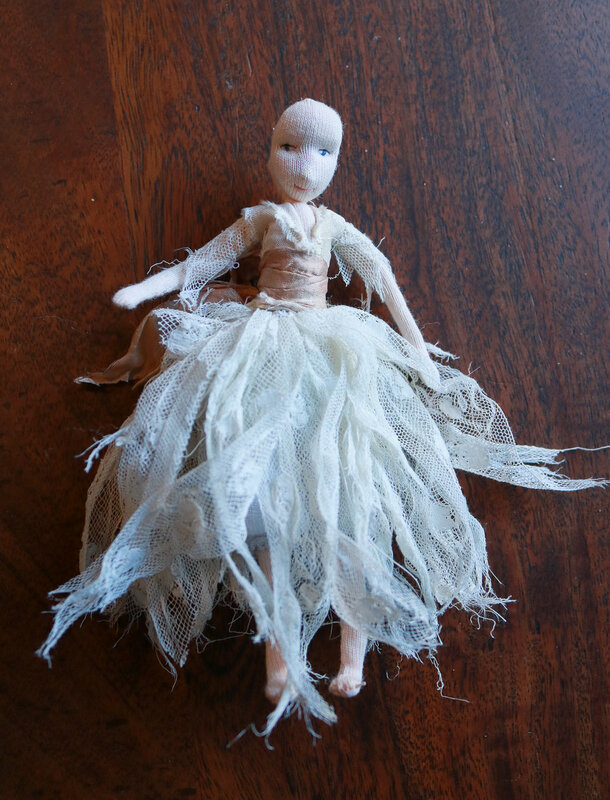 I had a role of beautiful vintage lace which I ripped into pieces for a ragged faerie skirt. I didn’t want any clean cut edges for her. 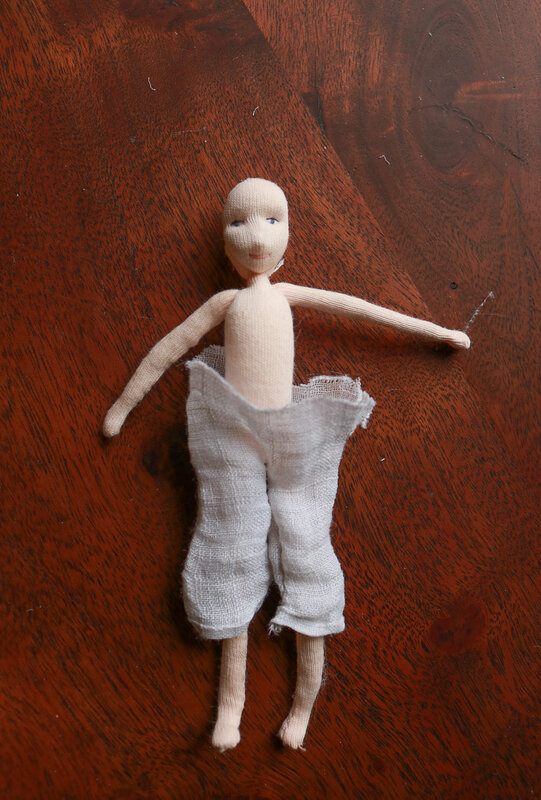 Her bloomers are made from a very loose weave vintage linen hankie, that also had a soft feel to it. 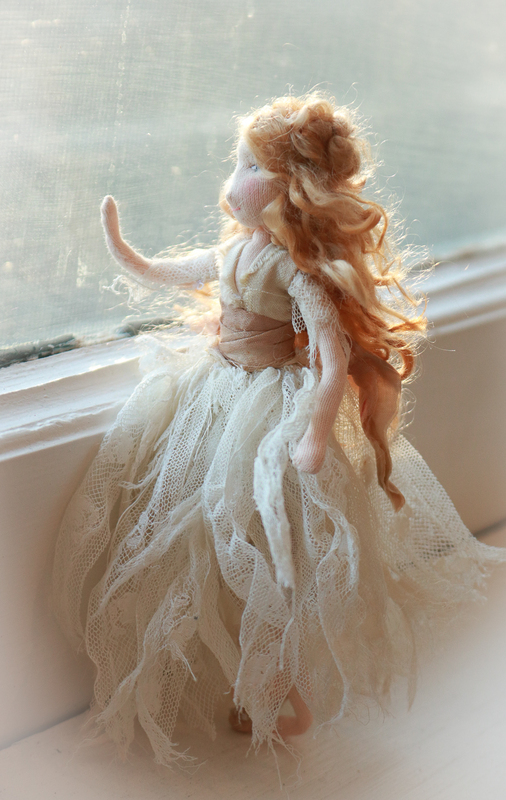 Her sleeves are the same lace, and her bodice is made from ripped up silk ribbon. Sew a running stitch, pulling each piece tight as you go, so you have a very full skirt. You can use any old lace or ribbon, and mixing fibres up looks lovely. Synch until it fits your faerie’s waist. Cut your bloomers by eye. The wider the leg the puffier they’ll be. Lace edges around hankies can be very sweet if left on the bottom edges. For these, I left the tiny seam. 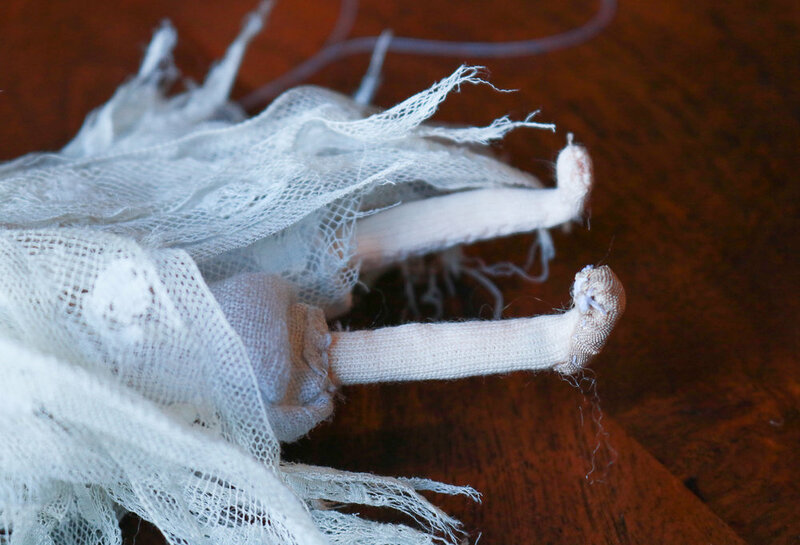 Sew your bloomers together with a tiny running stitch. Turn the waist in while sewing a running stitch around. Draw closed and tack in place. Wrap the skirt around and sew in place. Sew around the shoulder, and then run a stitch down the arm. I used one for each side, folding over the little lapel. Then, I wrapped another piece of silk ribbon around her waist and tied it in the back. Flip inside out and put on your faerie. Do the same for each leg. 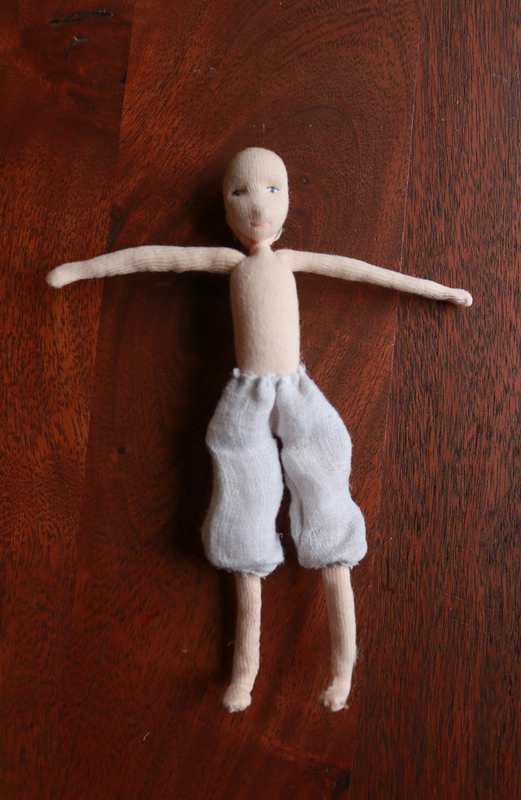 You can sew them into your faerie if you want them to stay at a certain level. 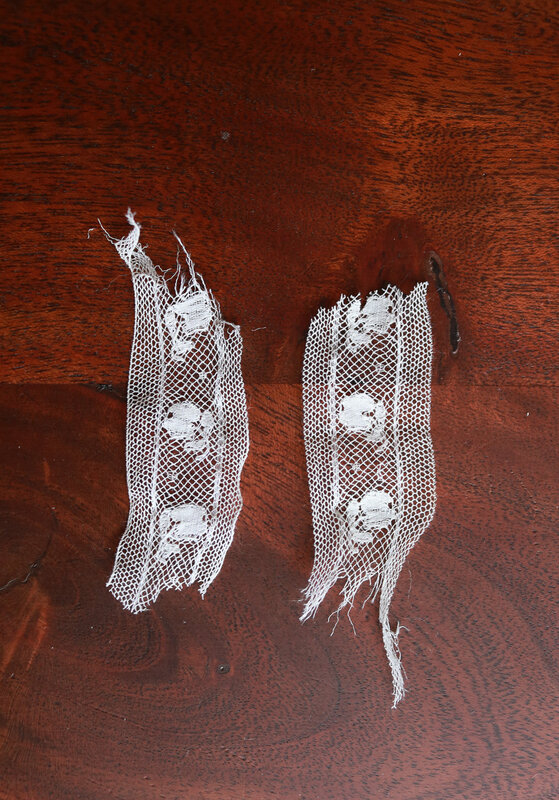 For Inwen’s sleeves I tore two tiny pieces of lace and folded them in half. You could do anything for her bodice. Wrapping a piece of ribbon around her torso would have worked nicely, as well. I decided to sew two little loops out of silk ribbon. For her shoes, I cut two tiny ovals and carefully folded over the edges, sewing a little running stitch around. Then, I held each in place sewing through the foot. I decorated the toes with tiny French knots. Copyright © 2016 Lavender & Lark. All Rights Reserved.